Flick the Tick Natural Tick and Insect Repellent works to repel ticks, mosquitoes and black flies and sand fleas! Our popular blend has been featured on in the news! Comes in 4oz. spray bottle. Flick the Tick blends are all natural, DEET-FREE, and smell great! Our special essential oil blends are made to help keep ticks and insects away. Comes in a perfect sized 4oz spray bottle. 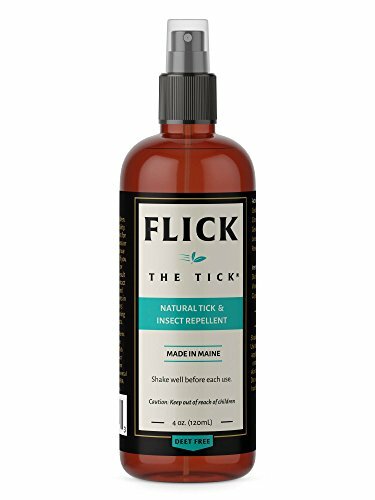 Active Ingredients: Cedarwood Oil, Citronella Oil, Rosemary, Geranium Oil & Lemongrass Oil All Flick The Tick products are created in small batches by hand, in Maine! Safe on Adults, children and dogs!